Nike Mojo high-visibility golf balls come in assorted colors to make them easy to identify in the fairway or on the green, and easier to find in the tall grass or woods. A powerful core provides maximum length off the tee, and an exceptionally soft cover ensures greater control on approach shots and on the green. 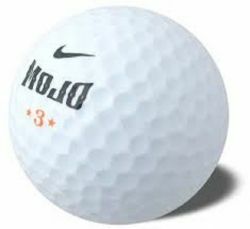 Mojo Golf Balls blend the serious performance Nike is known for plus the fun and bright colours. Nike Mojo Golf Balls are perfect for all levels of golfers with swing speeds between 90-105 mph.